This is the complete, uncut recording of the concert of the same name, held in the Music Hall of Kichijoji Art Museum on December 8, 2012. All of the tunes were composed by visual artist Hideki Nakazawa under the banner of “methodicism.” Pieces using two different systems–polyphonic tunes created from the Japanese syllabary, and instrumental pieces for solo performance–were performed alternately. Polyphonic tunes like “Japanese Syllabic Invention in Two Voices” and “Japanese Syllabic Canon in Three Voices” were realized with the voices of sei, Madoka Kouno, and Junichiro Tanaka; and instrumental pieces such as “From 1 to 56” and “Monophony with 768 Musical Tones Each Accompanied by a Grace Note” were performed on piano by Yuji Takahashi. The performances were recorded by Taku Unami. In these 51 tracks (total 46 minutes 58 seconds), the unique excitement permeating the venue comes across in the applause and feeling of tension between tunes, the composer’s on-stage talk at the end, and so on. Included with the CD is an insert with the e-mails exchanged by Yuji Takahashi and Hideki Nakazawa in the period between the performance request and the concert day (in Japanese only). 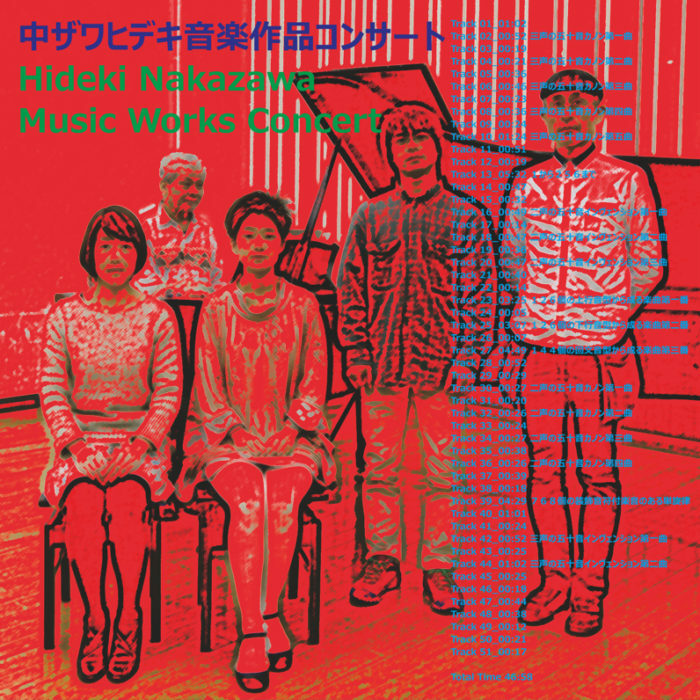 Different from Nakazawa’s previous studio-recorded CD Music Works – The Method Music since 1997 + Sounds for “Silly CG” Animations before 1996 (Naya Records, naya-0003, 2006), this is a rare live album showcasing the performers’ unique individuality.